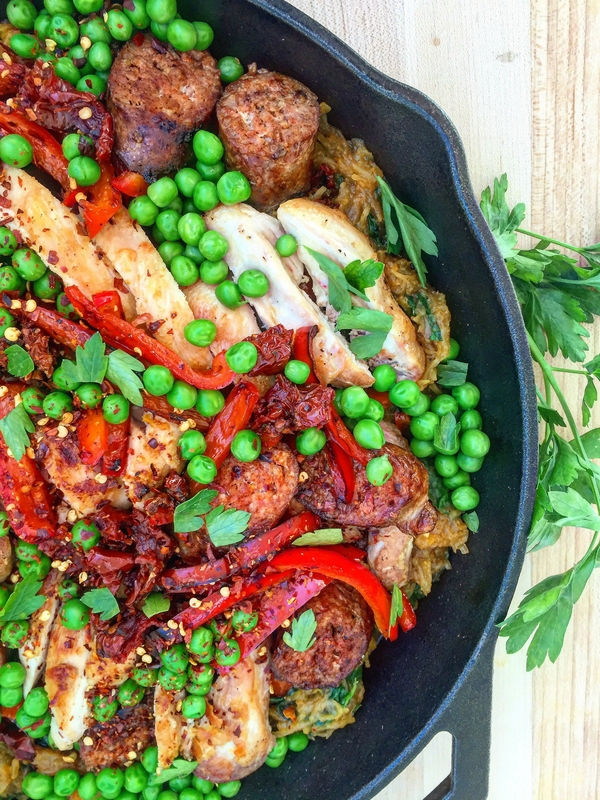 To be honest, this Spaghetti Squash Chicken Chorizo Skillet is a riff on grain-free paella. But… I forgot the shrimp, so it has no rice, no seafood, and no right to be called any type of paella. But! It does have golden chunks of chicken and savory slices of chorizo on a bed of smoky paprika-spiked vegetables, so I think it still has a lot of tastiness to offer. I made it for a paleo potluck with a few CrossFit friends this past weekend and this recipe made enough for all of us to sample a bit, plus leftovers for breakfast the next day. In addition to being massive, and an explosion of flavors and textures, I consider this a winner because its use of a single skillet means minimal cleanup, and the substitution of spaghetti squash for rice means it’s delightfully seasonal. I’m always excited to see the varieties of winter squash arrive in the markets, and spaghetti squash (with its quirky threads) is a particular favorite. This one-pan skillet combines leafy spinach and sweet bell peppers with starchy squash and savory chicken and chorizo for a complete meal. Heat a large skillet over medium heat, cook the chicken thighs for approximately 10 minutes (flipping halfway through) or until cooked through and browned on both sides. Remove from the skillet, set aside to cool. Once cool, slice into bite-sized pieces. Cook the chorizo in the skillet over medium heat until firm and browned. Remove from the skillet, set aside to cool. Once cool, slice into bite-sized pieces. Core and thinly slice the bell peppers. Cook over medium heat in the skillet (adding a tablespoon of coconut oil if necessary) until very soft. While the peppers cook, pierce the spaghetti squash's rind, approximately an inch deep with the tip of a knife, in various places a total of 5-10 times. Cook in the microwave on high for 12-15 minutes (depending on size). The squash will dent very slightly when pressed with the back of a spoon when it's cooked. Remove from the microwave and slice open, being careful of escaping steam, to cool. Once cooled, scrape out the seeds and discard. Once the peppers have cooked, scrape the threads from the cooked squash into the skillet. Maintaining the skillet over medium heat, add the salt and paprika and mix thoroughly into the squash and peppers. Work the spinach gently into the skillet mixture, it will shrink as it cooks. 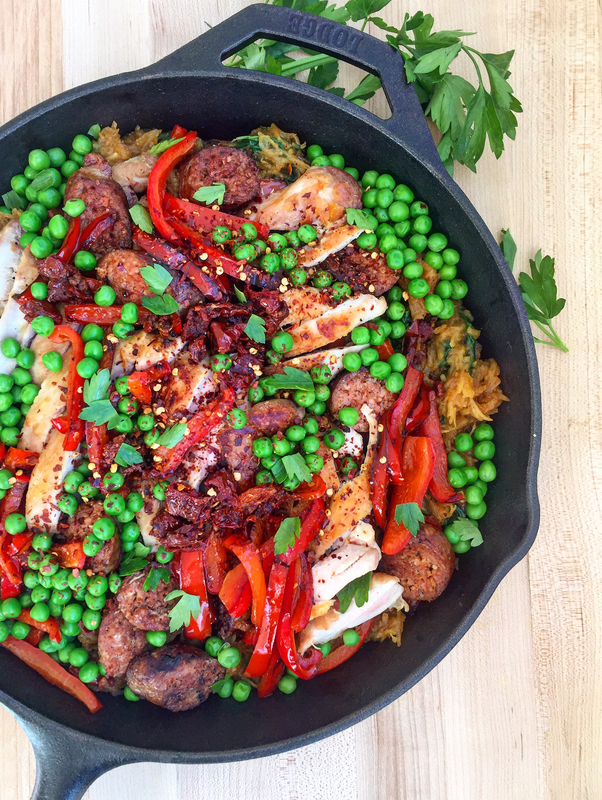 Once the spinach is wilted and thoroughly mixed into the vegetables, add the sliced chicken and chorizo back into the skillet to warm, then top with cilantro, chili flakes, peas sun-dried tomatoes and serve. This looks too pretty to eat, yet, it looks mighty good! Such an original recipe, thank you for sharing! Yes! It’s almost squash season. Love all of these ingredients! Yes, I get so excited about winter squash when I see it arrive every year. This recipe looks off the hook! And I’m always looking for more ways to use my cast iron skillet, so this is perfect timing. THANK you, it’s fun to make this on Friday and eat all though the weekend. Loving the idea of such a flavorful dish being one pan 😀 Beautiful photos, too! Quite a compliment, coming from you! So many colours and flavours and textures! This looks and sounds like it would be amazing. I love using spaghetti squash as a substitute for pasta, and I loooove things that can be made in one pot 😀 Thanks for sharing! Yes, spaghetti squash is now my past sub go-to! What happened to your Instagram? Ooh! I love the idea of chorizo with the spaghetti squash!! Haven’t tried that combo before – this dish looks awesome!! I love this recipe overall but have made so many changes that work better for my house. We aren’t big on chicken, don’t eat peas, and love sauce. We eat primal not paleo so we do still use cheese. So I made the following changes… replace chicken and sausage with bacon and breakfast sausage links cut into bite size pieces, leave out peas, and add alfredo sauce (homemade) just before serving, garnish with cheese, chili flakes, cilantro, and sun-dried tomatoes. If you want variety you should try my alternative version of this wonderful recipe (I do everything else exactly according to recipe).